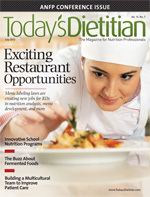 Dietetics professionals have launched extraordinary programs to improve the health of the next generation. Now that the new federal standards for school nutrition have been announced, more students are piling their lunch trays with healthful fruits and vegetables, hearty whole grains, and better-for-you versions of their favorite meals. However, some school districts decided long ago not to wait for a federal mandate to begin providing more healthful meal options in their schools—and, as a result, they’re way ahead of the game. These districts have developed innovative programs they continue to fine-tune, and they have plans to introduce more to ensure the health and well-being of the nation’s youths. Today’s Dietitian profiled four such school districts across the country known for their extraordinary school nutrition programs. They’re offering healthful meals to various ethnic groups, embracing the local farm-to-school movement, baking instead of frying, creating fresh foods for vending machines, cooking from scratch, developing sampling programs, and offering fruit and vegetable bars kids love. Read about some of the groundbreaking work of pioneering dietitians and other school district professionals that’s paying huge nutritious dividends. Miami-Dade, the fourth largest school district in the country with about 347,000 students, sees kids from various parts of the world roaming its halls. “Miami being a port of entry for the Western world brings many people from this side of the hemisphere,” says Carol Chong, MA, RD, LD/N, director of food and menu management for Florida’s Miami-Dade County Public Schools, who notes that students hail from Central and South America, the Caribbean islands, Europe, Asia, and beyond. As you might imagine, the diversity of Miami-Dade’s student population also brings varied tastes and cultural preferences, something Chong says the district has worked hard to address in its daily food offerings. Depending on the weekday, Miami-Dade students may have the universal Hispanic dish arroz con pollo (chicken with rice), roasted Cuban-style pork and plantains, Jamaican beef patties, Asian-style chicken chunks with oriental-flavored rice, or Southern favorites such as breaded baked chicken, collard greens, and corn bread. To ensure the healthfulness of its ethnic options, Chong says commonly fried selections such as Southern chicken and Asian rice are baked instead, adding that all school menu items must meet the Dietary Guidelines for Americans as well as the district’s wellness policy to make it onto students’ trays. Healthful offerings also abound outside Miami-Dade’s cafeterias through the district’s healthy vending program. “We offer low-fat yogurt and fruit with low-fat and whole grain granola, various sandwich wraps using spinach or tomato tortillas, Asian chicken lettuce wraps, [and various salads],” Chong says. To get kids on board with the healthful vending movement, Miami-Dade got local chefs involved with the project. The chefs worked with foodservice staff to develop recipes, which were taste tested by students. When items got the go-ahead from students’ palates, staff members were trained in preparation techniques and merchandising. One thing all districts profiled here have in common is that none are resting on their accomplishments thus far—they all have more innovative ideas in the works for how to get more good food into their students’ stomachs. For Miami-Dade, that innovation comes in the way of a food truck the district plans to use for a Summer Feeding pilot program. Working off the gourmet food truck idea that’s been featured on TV’s Food Network, Chong says they expect to take the truck to various underserved neighborhoods in the county and offer the same fresh and healthful foods provided during the school year to kids on summer break. “Food insecurity is all year long, and school meals are available only when school is in session. We hope to continue to provide nutritious meals to children during this time when school food programs are minimal,” she explains. With approximately 37,000 students, Saint Paul Public Schools may house just a fraction of Miami-Dade’s student population, but it’s Minnesota’s second-largest school district. Students here represent numerous ethnicities as well, speaking more than 70 languages and dialects. At Saint Paul, 73% of students qualify for free or reduced-price school meals, says Jean Ronnei, SNS, director of nutrition and custodial services for Saint Paul Public Schools. Though smaller in size, the district’s work to get students to eat healthfully is no less noteworthy. You could say Saint Paul has hopped aboard the fresh-and-local train, but this is nothing new to them. To take advantage of the region’s local bounty in schools, the district joined a national partnership in 2008 funded by the W. K. Kellogg Foundation called School Food FOCUS. “Through our work with FOCUS, we were able to increase the number of locally grown produce items we offer” in various school meals, Ronnei says, including local apples, onions, peppers, cabbage, and cucumbers. In another effort to increase students’ fruit and vegetable intake, Saint Paul offers all-you-can-eat fruit/veggie buffets, called Unlimited Choice Bars, offered at all schools in the district. The bars feature lots of fresh produce, including salad greens, fruits, and other fresh vegetables, as well as vegetarian protein offerings such as cottage cheese, chopped hard-boiled eggs, and bean and whole grain pasta salads. Students are also encouraged to boost their produce intake through the Fresh Fruit and Vegetable Program, which, through a USDA grant, allows the district to serve a daily fruit or vegetable snack at elementary schools where more than 50% of students receive free or reduced-priced meals. “Currently, we have 29 schools participating in the program,” Ronnei says. Saint Paul also offers a Breakfast to Go (B2G) program, through which healthful breakfast items are offered at no cost to all students throughout the district, Ronnei explains, noting that the popular B2G choices are fresh fruit, 100% fruit juice, whole grain cereal, low-fat yogurt, and district-baked breakfast muffins. The number of students enrolled in Vermont’s Burlington School District is roughly 4,000, and the district has a free and reduced meal rate of about 56% districtwide. Its population is also diverse, with more than 60 languages spoken in its high school alone. Though many wouldn’t envision Vermont as an exceedingly ethnic part of the country, Doug Davis, SNS, director of foodservice for Burlington Schools, explains that Burlington is a refugee resettlement community, which helps account for its diversity. “In Burlington, we’re very fortunate to have the diversity of ethnicities and cultures because it really impacts the culture of the school in a positive way,” Davis says. To address this diversity in the student population, Burlington offers various ethnic meals throughout the school year at its high school, highlighting a different region of the world each week. However, one need only look to Burlington’s farm-to-school program for its local efforts that really stand out. The farm-to-school movement started here in the early 2000s with various surveying efforts made possible by a USDA grant given to Shelburne Farms. After a few basic first steps—opening salad bars and offering more fresh fruit—the tests started in 2003. “Our first taste tests were really more about white bread vs. wheat bread, American cheese vs. cheddar cheese, trying to get kids open to the idea of trying different foods, not necessarily local at that time,” says Davis, who notes that the new whole grain regulations will be a cinch for Burlington students, who have been eating whole grain products for the last decade. After the kids were officially on board with those changes, the real local revolution started, and so began the taste testing of baby carrots vs. local carrots and Vermont apples vs. Washington or Oregon apples. While Davis is quick to praise the produce from the Pacific Northwest, especially since Vermont “would starve without it” because “we can’t grow all we need,” he also notes the value that comes with knowing what foods are grown nearby. In 2003, Davis estimates the district used 300 or 400 lbs of local food; they’re now using more than 100,000 lbs, contracting with 23 different farms. In addition to produce, Burlington uses local beef as well as local chicken drumsticks and dairy. Another innovative program that grew out of the farm-to-school project is the statewide Vermont Junior Iron Chef program, a joint fundraiser between the Burlington School Food Project and farm-to-school nonprofit Vermont FEED that aims to showcase local foods and help other Vermont schools join the local movement. With the fifth annual Junior Iron Chef competition held earlier this year, 71 teams and about 1,200 participants and spectators came together for some culinary competition with a greater goal of “getting kids who are interested in food and food systems connected to the foodservice directors within their schools,” Davis says. For the competition, students are required to include and highlight certain local foods in their recipes, so they must reach out to local farmers in their area to practice before the competition. Not only does it educate students about local foods, but “it also allows farmers to get involved in the program within their school,” Davis says. “The fact that kids will now cook with squash, beets, parsnips, and kale really changed the way they look at food and the role schools can play in the food system within their community, within their school, and inevitably within their state,” Davis adds. Local foods may be the foundation of Burlington schools, but Davis is far from satisfied. He has lots of ideas for new ways to get kids to eat more good food, one of which is an apple orchard the district plans to establish at one of its schools in the spring of 2013. The farm-to-school movement also has picked up speed in the western half of the country, particularly in Bethel School District in rural West Eugene, Oregon, which has 11 schools and 5,600 students. With 60% of students participating in the free and reduced-price meal program, Bethel offers free breakfast throughout its schools, and each school has its own production kitchen. For its first foray in the local movement, the district purchased apples since they used them in large quantities. “They’re not highly perishable, and they were readily available at a competitive price,” Kolpak says. Though she was initially skeptical when making that first call to Detering Orchards in July 2008, there haven’t been any problems, and today Bethel purchases all the apples it can from Detering’s. While the school district first bought produce directly from farms, Kolpak says it changed its purchasing model two years ago. Currently, the district acts in a partnership among contracted produce vendors and farms, which has allowed it to increase how much local produce it can buy. Besides the fresh produce offerings, Bethel also bakes a good percentage of its foods in its own bakery, ensuring the use of high-quality ingredients in school meals. “Bethel incorporates made-from-scratch recipes in our meal plans every single day,” Kolpak says. “We exclusively use a canola oil and applesauce blend for baking, and we use locally sourced red hard wheat flour in all our baked items. Posters featuring the monthly items (along with a picture of the farm it came from) are displayed in all cafeterias and are used in age-appropriate lesson plans to illustrate the concept and educate students about the benefits of these local foods. To educate kids further, Kolpak says the district sends some of its fourth-grade classes on farm tours to harvest produce. Then they’re taught how to cook with it after returning to their classroom. Moreover, seven of Bethel’s schools have functioning school gardens, which Kolpak says are intended to help students understand where their food comes from and how it gets from the ground to their plate. Bethel Nutrition Services also uses social media to market its nutrition efforts and get students and parents involved in advocating good nutrition. “We have our own Facebook page,” says Kolpak, noting that she’s still waiting for the medium to catch on with more students. On its Facebook page, featured menu items are highlighted and food programs explained in detail. Besides evolving its social media platform, Bethel also has its sights set on new projects. “In the fall we’ll be launching an educational component in the cafeterias using MyPlate as the model for teaching students how to self-select appropriate meals,” Kolpak concludes.